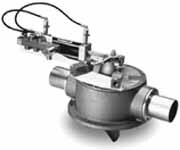 Bottom Diverter Valves are designed to direct product into a vessel from a pneumatic conveying line. Compressed air is used to actuate the valve into either the divert or through position. In the divert position, conveying air and product are directed into the receiver, where product is separated from the air stream as the air leaves through the exit port. In the through position, product and conveying air by-pass the receiver.